Ronald Joseph Corbett MacLean (born April 12, 1960) is a Canadian sportscaster for the CBC and Rogers Media who is best known as the host of Hockey Night in Canada from 1986 to 2014 and 2016 to present, and is also a hockey referee. MacLean was born in Zweibrücken, West Germany, at the Zweibrücken Air Base where his father was an officer in the Royal Canadian Air Force and was stationed at the nearby Metz-Frescaty Air Base in Metz, France. Ron MacLean Sr., born in Sydney, Nova Scotia, on May 4, 1922, married Lila MacDonald, from Iona, Nova Scotia, in July 1959. MacLean Sr. worked as a communications operator at Station Edmonton, while MacDonald was an airwoman/clerk stationed at RCAF Station Namao, just outside Edmonton. Fourteen months after MacLean's birth, the family moved back to Canada, initially settling in Chester, Nova Scotia. MacLean was four years old when his dad was stationed in Whitehorse, Yukon, with the Royal Canadian Air Force before relocating eventually in Red Deer, Alberta. MacLean's broadcasting career began in 1978 when he took a part-time position at CKRD-FM (FM 98.9), followed by duties at CKRD-AM (AM 850), and eventually a position as a weather presenter at CKRD-TV. According to his biography, he was called by the Program Director at the time (Martin Smith) to fill in for a sick friend who had recommended him. His initial duties were little more than pushing buttons and playing commercials. However, he was soon granted the opportunity to become a disc jockey. Ron MacLean was still in high school at the time. MacLean has worked on Hockey Night in Canada since 1986–87. He began anchoring telecasts out of western Canada, but near the end of the season, was moved to Toronto games when Dave Hodge was fired protesting a CBC programming decision on-air. He worked his first Stanley Cup Final that spring and has been the primary game host ever since. Part of his duties include hosting Coach's Corner with Don Cherry. Contract negotiations with CBC Sports Executive Director Nancy Lee and the president of English television had hit a standstill in the 2001–02 NHL season. MacLean threatened to leave CBC on the advice of his agent Don Meehan. That made headlines across Canada and following a huge public outcry, the CBC quickly gave in to his demands. In addition to hosting HNIC, he has been a part of the CBC's Olympics coverage since 1988. He took over as chief anchor following the departure of Brian Williams to CTV/TSN. MacLean was the main sportscaster and host for the 2008 Summer Olympic Games in Beijing until his mother died, causing him to hand over duties to Scott Russell. In 1993, MacLean served as an ice level reporter for NBC Sports' coverage of the NHL All-Star Game in Montreal. MacLean has also hosted CBC's coverage of the Queen's Plate. Beginning with the 2014–15 NHL season, MacLean was hired by Rogers Media when the company acquired the national rights to the NHL. 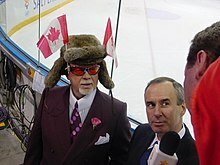 MacLean was removed from the host position of Hockey Night in Canada, but retained his role as host of Coach's Corner, and became an on-location host for the new, travelling Hometown Hockey broadcasts introduced that season. On June 27, 2016, Rogers announced that MacLean would be reinstated as host of the early games on Hockey Night beginning in the upcoming season, replacing George Stroumboulopoulos. MacLean has won eight Gemini Awards for his work with CBC. His first was in 1992 for Best Sports Broadcaster; he also won the Best Sports Broadcaster award in 1994, 1997, 1998 and 2001. He won Best Host or Interviewer in a Sports Program or Sportscast in 2004 and again in 2006. In 1996, he was inducted into the Alberta Sports Hall of Fame. In 2015, he was inducted into the Oakville Sports Hall of Fame. In 2016, MacLean, along with his Coach's Corner co-host Don Cherry, received a star on Canada's Walk of Fame. On January 16, 2010, MacLean presented a pre-game piece together with NHL representative Colin Campbell focusing on Vancouver Canucks player Alexandre Burrows, in follow up to an earlier incident between Burrows and referee Stéphane Auger in which the credibility of Auger was called into question. The piece was considered by a number of prominent sports writers, Canucks coach Alain Vigneault, and some fans to be a one-sided smear against Burrows. MacLean appeared on Vancouver-based sports radio show Team 1040 on January 18, 2010, and strongly denied being biased or one-sided during his presentation. In addition to his work at the CBC, MacLean is a former Level 5 referee with Hockey Canada. He has refereed in junior, minor pro, senior, and university leagues across Canada, mostly in the Southern Ontario region. He served as a referee in the September 29, 2006 NHL preseason matchup of the Buffalo Sabres and the Pittsburgh Penguins, calling one penalty in the final minute of the game. MacLean, his wife Cari, and his Standard Schnauzer live in Oakville, Ontario. MacLean was named Honorary Colonel of the 1 Air Movements Squadron at 17 Wing Winnipeg of the Canadian Forces' Air Command. On June 3, 2010, MacLean helped to rescue a man trying to take his own life, by jumping into the Delaware River in Philadelphia. MacLean and a few others sprung into action. He grabbed a velvet rope, jumped a wrought-iron railing and ran down to the water. When he arrived, he saw another man had already jumped into the river and pulled the man to a raft. MacLean says he and a couple of staff from the hotel used the velvet rope to pull the man onto the wharf, while the person who had jumped in to save him climbed out. MacLean is mentioned in a song called "Dear Coach's Corner" composed by the Canadian punk band Propagandhi, on their album Supporting Caste. The lyrics of the song are composed in the form of a written letter to MacLean addressing the issue of military propaganda during pre-game ceremonies, an issue that the members of Propagandhi find problematic. In Wapos Bay, the character "Ron McCrane" is based on MacLean, starring alongside "Don Redcherry", based on Don Cherry. The song "Canadian Girls" by Canadian country music artist Dean Brody mentions MacLean. ^ Ron MacLean, Kirstie McLellan Day. Cornered: Hijinks, Highlights, Late Nights and Insights. ^ "Playing the Game (Page 3)". Archived from the original on 2011-06-11. Retrieved 2017-09-11. ^ "2008 Queen's Plate Entries". Horse-races.net. Retrieved 2013-01-19. ^ "Ron MacLean to host Hockey Night in Canada, with David Amber". Sportsnet.ca. Retrieved 27 June 2016. ^ "Ron MacLean to replace Strombo on Hockey Night in Canada: Feschuk". Toronto Star. Retrieved 20 June 2016. 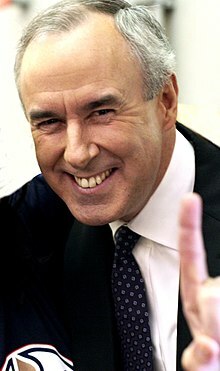 ^ "CBC.ca - Program Guide - Ron MacLean". Archived from the original on 2007-12-14. ^ "Burrows slams referee after loss to Predators". The Sports Network. 2010-01-11. Archived from the original on 2010-01-24. Retrieved 2010-01-14. ^ "Burrows given no chance to defend himself". The Globe and Mail. ^ "Alex Burrows ignores character assassination". The Vancouver Sun. Archived from the original on 2010-01-21. ^ "Vigneault slams CBC's Maclean". The Globe and Mail. ^ "Ron MacLean referees NHL game". CBC News. September 30, 2006. ^ "Hockey Night in Canada's Ron MacLean jumps in river to save suicidal man". The National Post. Postmedia News. June 3, 2010. Archived from the original on 29 January 2013. Retrieved 3 February 2011. ^ "CBC Reads: Ron MacLean". CBC. Retrieved 10 August 2015. ^ M, Darren (2 November 2009). "Interview with Propagandhi". Silver Sevens. Retrieved 10 August 2015. This page was last edited on 22 April 2019, at 05:36 (UTC).